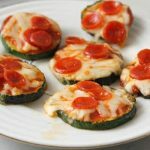 These Zucchini Pizza Bites are a great low-carb appetizer option. You get all the comforting flavor of a pizza, in a bite-size portion served on a zucchini slice in place of a calorie and carb-laden crust! One of my favorite ways to get my family to eat healthier foods is to integrate smarter food choices into the dishes they already love. And since we like to host a lot of gatherings, I’ve applied this philosophy to our party food too. My daughters were helping me brainstorm appetizers to serve at our most recent party and they came up with mini pizzas. They wanted to make bite-sized pizzas on little rounds of pizza dough. I realized that by replacing the pizza dough, I’d save a bunch of time, effort, carbs and calories! I’d save myself the trouble of making the pizza dough and shaping it into small rounds and would only have to slice up a zucchini! The end result was this recipe for Zucchini Pizza Bites. To our delight (and our guests), these turned out great! The best thing about this appetizer recipe is that it’s so simple! You just need 4 ingredients and a few minutes to get them ready for the oven. First, simply cut the zucchini into 1/2″ thick slices. To make sure my pieces are consistent in size, I use a mandoline , but you can also just use a knife and do your best to eyeball the thickness. Next, arrange the zucchini slices on a baking sheet lined with parchment paper or aluminum foil . Top each slice with a spoonful of marinara sauce. Then add a pinch of mozzarella cheese to each slice and sprinkle on some mini pepperoni. Bake at 375 degrees for 10 to 12 minutes. The cheese should be lightly browned. Serve immediately. These zucchini pizza bites taste best when they’re warm. 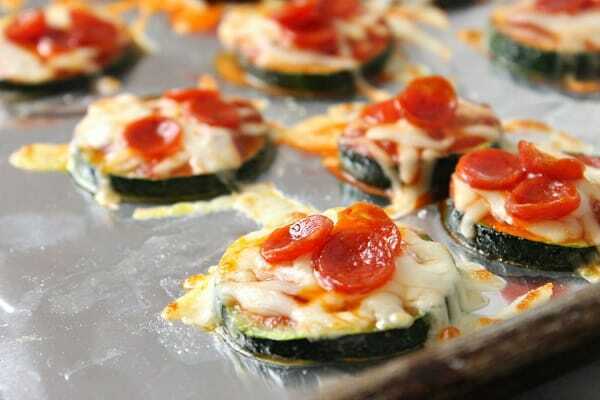 If you liked these Zucchini Pizza Bites, you might enjoy some of these other easy appetizer recipes. These will be a big hit on game day, I love your pizza bites! Hope you are having a great week and thanks so much for sharing your post with us at Full Plate Thursday! Delicious recipe and light in calories for someone who tries not to eat carbs as well ! Hi it’s Kristina from the Thrifty Thursday Link Up Party. This is such a smart idea. Perhaps a good healthier option for super bowl party snacks? And a good way to get the kids to eat veggies! These are great! Gotta start my low carbing again! Sharing! Thank you for sharing on Merry Monday! We hope you will join us again next week! Woo hoo! 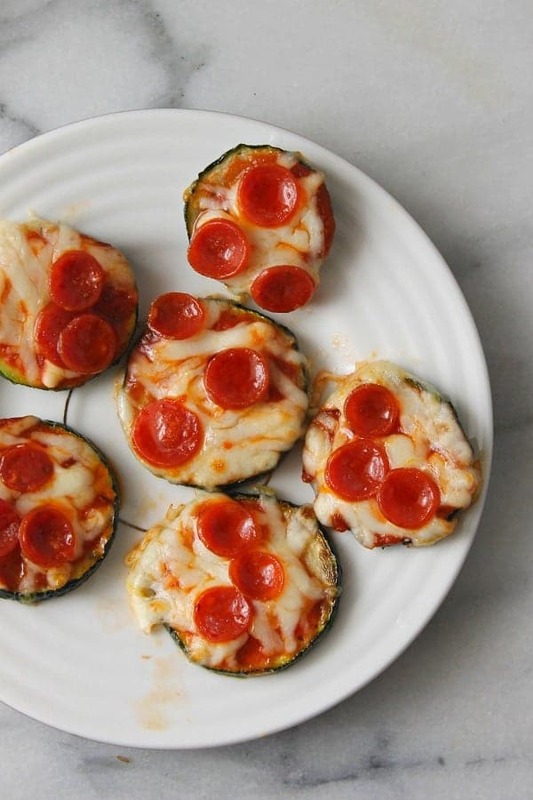 I think my kids would eat these, as we love pizza english muffins in our house. These are definitely worth a try! I love these – Pinned! Thanks for sharing at the What’s for Dinner party – hope your week is awesome! I need to come back and give my “thumbs up” for this recipe! Like magic! My kids eat anything with pizza on top! Thanks! 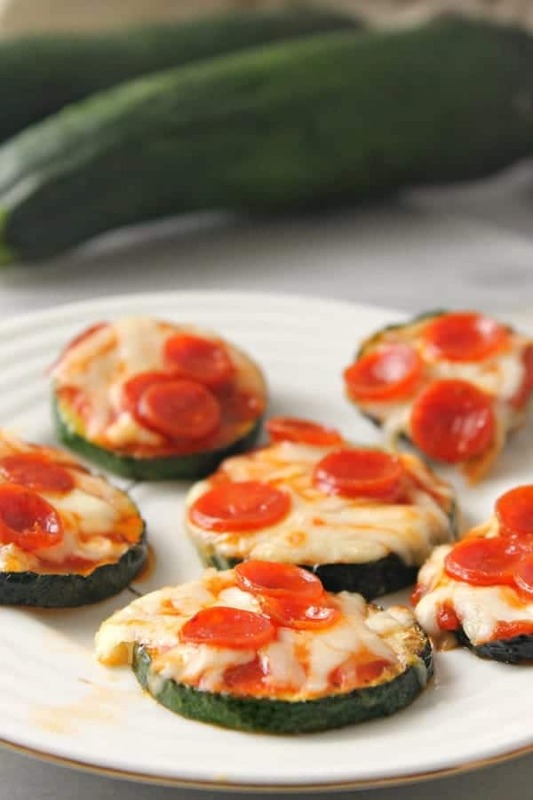 These scrumptious Zucchini Pizza Bites were a huge hit at our holiday gathering! Amid all the carbs and sweets, these awesome little appetizers were so appealing. I’m always looking for healthier types of finger foods, and this one fit the bill just right! This recipe is BRILLIANT! I never thought of using zucchini as the base but it works perfectly! We loved it! You are definitely my spirit animal! I am all about quick, easy, finger foods for dinner. 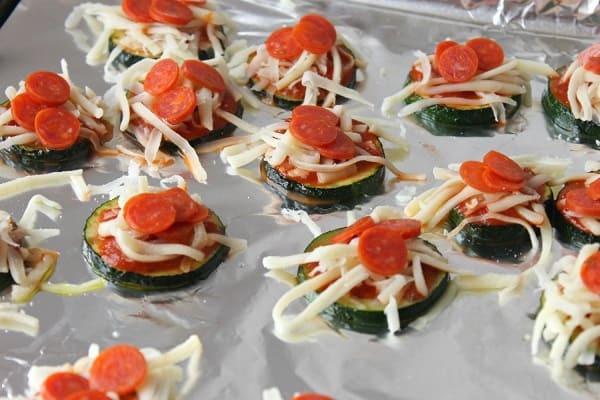 With these pizza bites, I was able to sneak in some veggies while making my kids think they were eating fun pizza bites. Thank you so much for this Delicious, if a bit sneaky, recipe.